I have to start by saying how hooked I was when reading this book. The plot was so tense and had me really thinking about what was going to happen. The plot was so open to interpretation (something the author mentioned in an interview), that I felt like it was all unfolding inside my head. It is a great feeling that you rarely experience whilst reading. I read this book very quickly; I was easily grabbed by it when I started reading it. Now that I have mentioned the plot, here is a quick summary. The book’s main character is called Christopher. He is a 15 year old boy who has Asperger’s Syndrome. Christopher lives with only his dad in Swindon, because his mother died from a heart attack. One night, he finds the neighbour’s dog, Wellington, dead, with a garden fork through its stomach. Christopher is then arrested after the police intervened and Christopher got scared and hit one of the officers. Afterwards, Christopher becomes determined to find out who killed Wellington. During the investigation, Christopher discovers some new information that sends him on a trip to London. This journey was not easy for Christopher, as he finds it hard to communicate with people, making it a lot harder to find the right train and platform. The story then dynamically escalates from a simple detective novel into a more powerful and more serious story. That was the summary for the first part of the book. As I wanted to keep this review spoiler-free, I didn’t go into the details of exactly what Christopher found out and why he is going to London. However, I am going to say that this book is very good at providing a build up in the plot. At the beginning of the story, it only has one side to the plot. By the end, more and more layers are accumulated to further enrich the experience for the reader. The writer does an amazing job at opening up the plot, which leads to a very satisfying end. It makes people feel like they are going through a journey, along with Christopher. Speaking of journeys, I must mention that the writer uses empathy as a major point in the book. As I said, it made me feel as if I was on a journey with Christopher. When Christopher was getting shouted at for acting stupid at the train station, I felt like I was being shouted at. I was almost getting to the point that I wanted to tell him to tell the other people at the station that he has Asperger’s. It was another effective tool to hook any reader. Overall, I was genuinely impressed by this book. It had one of the most detailed and deep plots of any books I have read, even though it is written simply. The way that the writer makes you feel as if you are on a journey with Christopher adds to the excitement. This book is made so that the reader can guess what is going to happen, which makes you want to read on to see if the predictions you made were indeed going to happen later on in the book. This is without a doubt one of my favourite books, and I hope you enjoy reading it too! 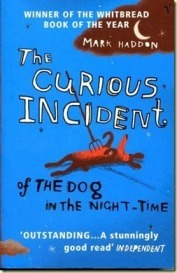 No Comments on "Curious Incident of the Dog in the Night Time"